PENTAKSIRAN Tingkatan Tiga (PT3) results were announced on Dec 14. PT3 is a school-based holistic assessment of students on a continuous basis. Schools and teachers are solely responsible for the administration of the examination, marking of exam scripts and release of results on a date fixed by the Education Ministry. As a teacher, I have come to know that parents are much more enthusiastic and nervous about PT3 results than their children. I have observed various reactions during results announcements. For example, some parents start praying the moment teachers distribute the exam slips. Some parents cry when they learn that their children were not in the best students category. The disappointment is clear. I do not blame them. As parents, they have most probably tried their best to provide the best guidance to their children to obtain good PT3 results. As an educator, all I will say is that regardless of what your children scored in PT3, as a parent, do not give up or be disappointed with your children. Please continue to provide the best guidance you can and be motivators to your children. Always remember parents should be their children’s best friend. PT3 is not the end of your children’s life. It is the beginning. It is just a public examination to determine which stream your children should be in during their upper secondary school. Do not repeat the common mistakes many parents make. Discard the thought that your child will have a bright future if he or she is in the science stream. Do not pressure your children to be in the science stream if he or she is not inclined to core science subjects. Being unable to perform well in core science subjects such as biology, chemistry and physics, in Form Four and Form Five, will drive them to depression. Always bear in mind that there are many students from the arts stream who are successful and have a bright future. Last, but not least, a single written public examination that assessed holistically will never be able to determine your children’s future. I would like to congratulate all PT3 2017 candidates. You are all excellent. PUTRAJAYA, Dec 14 (Bernama) — Sekolah Menengah Kebangsaan (SMK) Putrajaya Presint 16(1) was among the 300 pilot schools that received the Pentaksiran Tingkatan 3 (PT3) examination result in a holistic form of assessment, today. Its principal Ab Aziz Mamat said the Form Three Students Profile Report which was announced together with the PT3 examination result not only showed the students’ academic achievement but also their achievement in physical activity assessment, Sports and Co-curricular Assessment, Psychometric Assessment and Classroom Assessment. “For the first year of its implementation, parents can know directly their children’s potential and not focus solely on the numbers of As attained. “I strongly support the ministry in introducing the latest student assessment format as it will produce balanced students in all aspects,” he told reporters after the PT3 result announcement, here today. He added an individual’s excellence should not only be measured through the academic achievement but also physical fitness and personal character. Meanwhile, Hatifah Mohamed, the mother of a student, said the new PT3 result format which was introduced this year was better than previously, but it needed to be improved especially for parents and students’ understanding to interpret their result. “The new result format had been explained by teachers since the PT3 trial but there are several elements that are difficult for me to understand the meaning of each result and I hope it will be better next year,” she said. UPSR, SPM, STPM, GCE — just a few of the acronyms haunting many young minds at this time of the year. Young minds and their parents alike. Remember the days when everything was a race? First to reach the bathroom in the morning, first to down their Milo, first to call shotgun for the ride to school. First to sit on the swing at recess, first in line for canteen lunch. First on the school bus to secure the best seat and first to reach the front door and ring the bell. A happy childhood consisted mostly of healthy competition among friends and siblings, a race to be the first in all things that, from an adult’s perspective, don’t really matter. Most children gladly put their competitive mind to rest between recess and lunch. Pupils used to run out of the classroom, not into it. Hardly anyone pushed and shoved to be the first at the blackboard and try their luck at a complex math formula. Oh, happy childhood days. Not the most ambitious of times, but happy days, nonetheless. So, what happened? Instead of a rambunctious crowd, today’s pupils march in single file from their parents’ cars onto the school grounds, born down by a school bag so big and heavy that the child who carries it could easily find space to sit in it herself. If Malaysian schools run two sessions per day, a fact that absolutely boggles the outsider’s mind, where are all the students that have the other half of the day off? Why are they not playing outside, in their front yard, in the neighbourhood park? Why are they not hanging out at the local mall or mamak stall? Where and when are today’s children being children, where are the nation’s teens being pubescent? Youngsters have no time to be childlike, or rebellious, or sullen, or dreaming, anymore. Youngsters are at tuition. They are at tuition centres that have popped up all over the country like “mushrooms growing after the rain”, to borrow a local saying. In today’s competitive world, the rat race starts early. Excellent grades in academic subjects are the primordial benchmark that sets kids apart from their peers; the yardstick that determines a parent’s measure of success at their job as a progenitor. Academic excellence is a must in secondary school; it is even the norm in primary school. Parents and guardians send their scions for after school tuition up to seven days a week. Gymnastics and piano lessons are squeezed in somewhere in between. The “Asian F” is a very real notion. It is the widespread understanding that an A- is not good enough. The pressure on school children and their parents is growing to unhealthy proportions. At the same time, many life skills are thrown overboard in a constant effort to be the best among the best. Professors in tertiary education lament the fact that they lecture classes of exceptionally well-instructed students who don’t understand what further education is all about. Students are bright and diligent, but they don’t know how to think critically, how to build an argument, how to debate, or how to work towards a solution as a team. If parents and schoolchildren willingly submit to the burden of pushing for always better grades, it is in an effort to be best prepared for the real rat race, the demands of modern career perspectives. However, it seems that academic excellence is not the whole ticket. Employers undoubtedly look favourably upon perfect scores. But, recruiters also look for attributes such as individuality, drive, passion, curiosity. These aren’t skills learned in the classroom, nor in a tuition centre, no matter how well intentioned the teachers and tutors might have been. These character traits are fashioned on the playground, on a football field, in a band, even while playing video games. At first glance, this argument might come across as irresponsible, dismissive of academic values, rebellious even. It is not. It is simply an attempt at widening the scope of modern education. A healthy education should be a marvelous journey, not a race. It is a plea for restoring a childhood that leaves space for learning how to fail, in order to better succeed, a childhood that is given the opportunity to grow at one’s individual pace. It is an appeal, to give children the chance to spend time in a meadow, so that they know how to stop and smell the roses when they grow up. PUTRAJAYA (Bernama) — With just a few more days left till the new school year, those who sat for the recent Pentaksiran Tingkatan 3 (PT3) evaluation will have to finalise their academic choices for next year. Over 400,000 students will have to decide whether to pursue the science or arts stream and whether to opt for boarding school, technical school or a vocational college. The PT3 results were announced only recently, on Dec 19, but by then many would undoubtedly have made up their minds on where to pursue their upper secondary education. This was certainly the case with many of the students at Sekolah Menengah Kebangsaan Putrajaya Presint 8(1). The writer had a chance to speak with them when visiting the school during the PT3 announcement recently. One of them was Aqmar Batrisyia Zakaria. “I would like to become a linguistic expert because my passion lies in anything to do with languages. 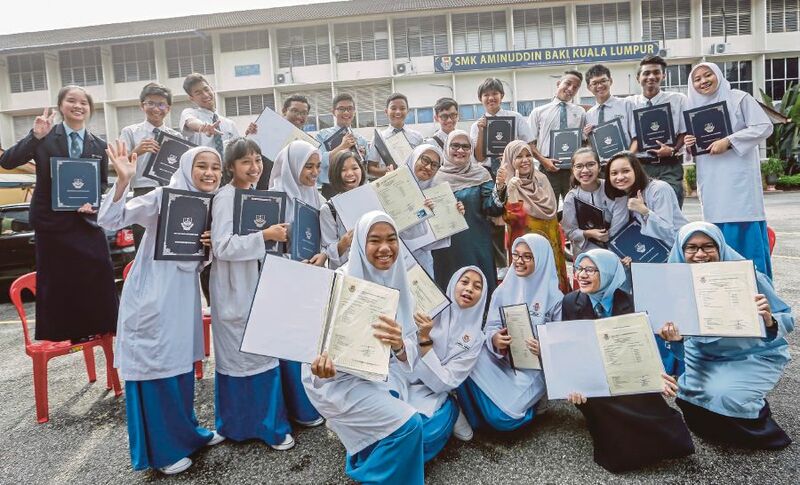 I may have scored 8As and 2Cs and I know that I could easily choose the science stream, but that is not where my heart is,” said the 15-year-old to Bernama. Her decision to not opt into the Science stream resonated with the results of her Psychomestric Assessment (PPsi), which she received alongside her PT3 results. “The (PPsi) test measures my interests and capability. The results state the three fields and career choices that are most suitable for me. “I found that my ambition to become a linguistic expert corresponds with the results of the assessment,” said Aqmar Batrisyia, who spoke fluent English and could converse in Korean and Japanese as well. On the day students receive their PT3 results, they will also receive another three sets of result slips which are the school assessment, psychometric assessment and a sports assessment. Schools will then decide, based on all four assessments, which stream a student is best suited for thus helping parents and students make a more informed decision on the selection of streams. Based on her results and interests, her parents decided to send their only child to a private school known for its focus on languages next year. The writer could not help but compare Aqmar Batrisyia’s certainty in a decision concerning her future with that of the students during her time, circa 1998. After the Penilaian Menengah Rendah (PMR) results were out, many of us were still at a loss on what to do next. Those with excellent results and scores of A on their PMR result slip would typically opt for the science stream or boarding school. Those whose results were less than stellar would be placed in the arts stream or sent to vocational schools. Many of the students back then had trouble identifying personal interests and strength, even up until SPM. In fact, some only realised of their poor interest in the field they pursued months after entering university. This has resulted in the waste of precious resources, especially time. However, not many of the 15-year-olds today have the same problem, thanks to the PBS system. Despite their age, many are certain of their interests and strengths and the corresponding path to pursue. In fact, many who achieved excellent results for their PT3 chose to not pursue their education in the Science stream. With the PBS system, the method of determining the most suitable form of upper secondary education is no longer based solely on academic results. Starting 2014, students’ success is no longer measured by how many As they can score. Instead, the focus is now on identifying their potential and how best to polish it so that they can utilise their talents and ability to build a career in which they have an interest it. The new PBS system was implemented in stages in secondary schools nationwide, starting with Form 1 students in 2012. The students went on to become the first batch to undergo the PT3 assessment in 2014. The Malaysian Examination Board’s Development and Policy Management Sector Head Dr Rahimah Adam said that PBS was seen as the more holistic approach because it assessed the cognitive, affective and psychomotor aspects of a student, in line with the National Education Philosophy. On the day the PT3 results are announced, students would not only receive the PT3 results slip but three other results that could be used in determining the stream they should pursue. “PBS covers four components namely the school assessment, the central assessment, the physical activity, sports and co-curriculum assessment as well as the psychometric assessment. “However, many are still focusing only on their PT3 results, ignoring the importance of the results of the other assessments,” she said. For Rahimah, PBS was designed not only to polish students’ academic potential but their co-curricular achievements as well. The main focus, however, is to produce excellent students who are able to judge their abilities holistically. As Aqmar Batrisyia has shown, the PPsi evaluation was instrumental in determining the preference of a student, helping them make informed decisions. The Form 3 PPsi test covers their Career Interest Inventory based on ‘Holland’s Typology’ and the Multiple Intelligences Inventory. The former measures the interest and career inclinations of a student while the latter measures their abilities and intelligence on a detailed level. “PPsi will be handled by the school’s counselling teachers through the methods provided by the Examination Board and it can be used by parents and teachers to evaluate the best stream for a student. “However, the results need to be read together with the other results to better assess if the inclinations of a student matches up with his or her abilities,” said Rahimah. However, the school assessment is an academic process that evaluates a student’s progress starting from Form 1 to Form 3 and is handled fully by the teachers and school. It is aimed at observing the individual abilities of a student through projects, tests and exercises prepared by the teachers. The central assessment, meanwhile, is a joint responsibility of the examination board and the school. The scoring system and instruments used are provided by the board while the administration, examination and reports are done by the school. The quality of implementation of PT3 at schools is determined by the school as well as an external assessor appointed by the examination board. CYBERJAYA: Parents’ fixation with As are making them neglect their children’s holistic achievements under the Pentaksiran Tingkatan Tiga (PT3), said Education Minister Datuk Seri Mahdzir Khalid. “It has become a culture across the board in our society to achieve (as many) As (as possible). “When the PT3 results are announced, reports on all four assessments – physical, sports and co-curricular activities as well as a psychometric – are released, but no one looks at these assessments as everyone just wants to see how the child has performed in their academics,” Mahdzir told reporters yesterday after witnessing the signing of a note of understanding between the ministry and the Malaysian Administrative Modernisation and Management Planning Unit. The two parties are looking to upgrade the ministry’s data centre into a Public Service Data Centre. Mahdzir said the ministry would work towards improving communication with the public in fixing the public’s perception that only academics counts. “This is the future of our education, where holistic assessments are carried out instead of having exams like in the past,” he said. “Maybe we need to change the way the PT3 results slip look,” he said, adding that this was because the first slip a student receives is that of their academic assessment followed by the other three. He said on Monday that PT3 was a holistic assessment of students based on continuous assessments by the school, which is responsible for the administration, marking of examination scripts and release of the results. KUALA LUMPUR: Some students who obtained their Pentaksiran Tingkatan Tiga (PT3) results are hot under the collar over the difficult HOTS (higher order thinking skills) questions in Science. Several 15-year-olds from SMK Saujana Impian felt the questions had prevented them from scoring better grades to some extent. Roosimin Kaliappan, who obtained 7A’s, 1B and 1C, said her teachers prepared them well by providing sample questions from previous years, but the questions they eventually had in the assessment were still difficult. “We did not expect the Science paper to be filled mostly with HOTS questions. It was just tough,” she said. Maryam Kamiliah Rahime, who scored 10A’s and a C for Science, shared Roosimin’s sentiments. “The HOTS questions were very tough. I didn’t think it would be that difficult,” she said. Maryam said although she was happy with her results, she was frustrated with the C.
Suriyah Ganesan, who had put in at least six hours a day during his revision, was not happy with his results. The students are the third batch to sit for the PT3, which was introduced in 2014. HOTS questions were introduced when PT3 was first introduced. A Science teacher said the paper was more difficult this year. “The Examinations Syndicate prepared a list of rules on the type of answers that can and cannot be accepted. The marking process was also stricter compared to the previous year,” she said. She said some of the questions in the paper were based on general knowledge, rather than the textbooks, which could affect the students’ final score. She said all schools had different sets of HOTS questions and she could not divulge the questions in the paper. But to give an example, she said the questions were along the line of showing pictures of “a tissue box, a needle and a brush” and asking the students to draw up a conclusion on what they could do with the items. On his Facebook page, Education Minister Datuk Seri Mahdzir Khalid advised parents not to look merely at academic achievements, but the holistic development and potential of their children. “PT3 is a holistic assessment of students based on continuous assessments by the school, which is responsible for the administration, marking of the examination scripts and the release of the results,” he said. by SANDHYA MENON and LEE CHONGHUI. TAWAU: The Royal Air Force helicopter crash in SMK Balung proved to be no obstacle for students of the school from achieving excellent results in the Form 3 Assessment (PT3) examinations. Five students scored 10As which is more than last year’s sole straight-A scorer. The school recorded a performance of 31.68 per cent for PT3 this year. Senior Administrative Assistant for SMK Balung, Zanaliza Jamaludin said even though the incident occurred two weeks before the examinations and the results this time were even better. “We were worried at first because the PT3 students could not attend revision classes because the school was ordered closed due to safety reasons as a result of the crash. “They did their revision at home and a week later, sat for their examinations,” she said when met at the school yesterday. Siti Norsyafika Abdullah, whose parents work as a labourer and dressmaker, was one of the five who scored 10As. She said the helicopter crash did not interfere with her preparations for the PT3 exams at all. “I was not terrified because I wasn’t directly involved but there was some worry another crash might happen while the examinations were taking place. Thank goodness all went well,” she said. The eldest of three children, she was expecting to get only 7As so the results yesterday came as a pleasant surprise. Nezwan Helmy Hamzah was the only male student who obtained 10As. He admitted that to this day, he still gets frightened upon hearing the whirr of helicopter blades overhead. “I actually saw the helicopter overhead and then crashing into the roof of the school. So that was quite a traumatic experience for me,” he said. A female student who had to skip classes for a month to take care of her ailing father is grateful to be able to sit for her Form 3 Assessment (PT3), which started on Monday. She thanked Kuala Nerang assemblyman Datuk Badrul Hisham Hashim for making it possible for her to sit for the examination at her new school at SMK Padang Terap. Nurul Fatin Aina, the second of four siblings from Kampung Padang Chenderai, said she did not expect to be able to sit for the examination after being absent from school for a month as she had to take care of her father, Badrul Hisham Tajuddin, 43, who was bedridden after a stroke in August. “I just did not know what to do and was confused. I wanted to sit for the PT3 examination, but how can I leave my father,” said the former SMK Taman Ria, Sungai Petani student. She thanked the Kuala Nerang assemblyman for helping to arrange for a transfer to the new school, which is nearer to where her father stays. Nurul Fatin Aina said she studied hard to catch up with the lessons she missed in school. “I hope I will be able to do well and achieve satisfactory results,” she added. Nurul Fatin Aina and her younger sister, Nurul Farawahida, 11, had been living with her mother in Sungai Petani after their parents separated in 2008. KUALA LUMPUR, Oct 10 (Bernama) — The nationwide Form Three Assessment (PT3) written test began on a smooth note today. The four-day examination kicked off with the Bahasa Melayu and Mathematics papers and to be followed by English and Science tomorrow. 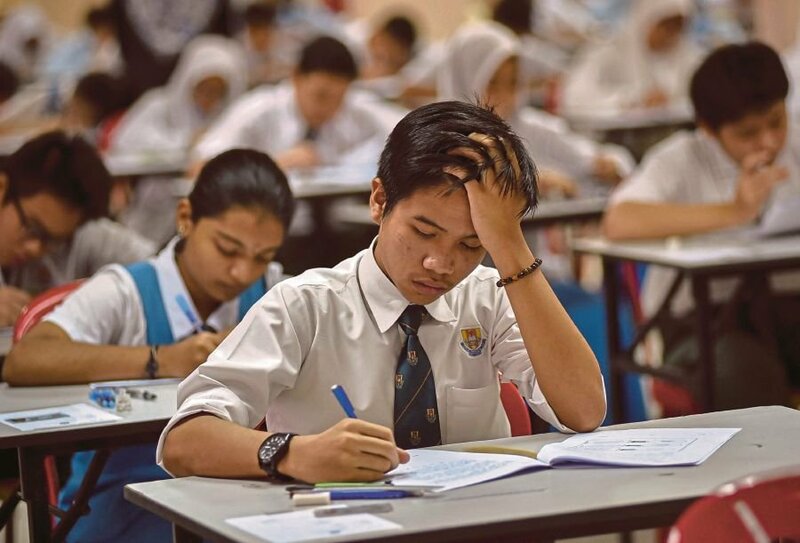 Education Minister Datuk Seri Mahdzir Khalid in his Twitter account called on all Malaysians to pray for these students and he also advised them not to be very stressed during the exam. A total of 20,518 candidates were sitting for the examination in 105 exam centres in the city. In SELANGOR, State Education Director Mohd Salleh Mohd Kassim said 76,850 students were sitting for the examination in 327 centres. “A total of 327 chief invigilators have been appointed by the schools to ensure the PT3 test goes on smoothly,” he said. In NEGERI SEMBILAN, State Education Director Rusni Ab Jalil said 17,530 students were sitting for the written test at 133 exam centres statewide. Meanwhile, in MELAKA, Education, Higher Education, Science and Technology, Green Technology and Innovation Committee chairman, Datuk Md Yunos Husin said 13,631 candidates were sitting for the exam at 85 centres throughout the state. He said of the total, 89 candidates were students with special needs and 12,929 were from schools under the Education Ministry. In KELANTAN, the Deputy Director of Education Jaafar Ismail said 31,374 candidates from 241 secondary schools were sitting for the examination including 38 special needs candidates. “They comprise nine students who are mentally-impaired, hearing-impaired (14), physical problems (five), other impairments (eight) and visually-impaired (two),” he said in a statement. In PERLIS, deputy director of the Perlis Education Department, Azman Ghazali said 4,075 candidates, including seven with special needs, were sitting for the PT3 in 31 examination centres. He said these included 3,793 candidates from 28 government schools, 142 from two private schools and 140 from Maktab Rendah Sains MARA (MRSM). In SARAWAK, 204 exam centres were opened for 39,657 candidates sitting for the PT3, comprising 182 in government schools, 13 in private schools, three in MRSM, three in juvenile schools and three in private centres. The 38,237 of the candidates were from government and government-aided schools, 1,173 from private schools, 220 from schools under government agencies other than the Education Ministry, and the rest were individual candidates as well as religious schools. PUTRAJAYA, Oct 9(Bernama) — A total of 8,784 candidates will sit for the Sijil Tinggi Agama Malaysia (STAM) written examination at 224 examination centres throughout the country and Cambodia from Oct 17 to 19 and Oct 25 to 26. From the number, 2,110 are from government schools, government-aided schools and aided religious schools; 4,617 from state religious secondary schools; 680 from people’s religious secondary schools; 30 from private schools registered under the ministry; 1,269 private candidates and 78 foreign candidates (Cambodia). The Education Ministry said in a statement that the examination schedule had been distributed to the schools involved and could also be downloaded from the Examination Board’s website via http://www.Ip.moe.gov.my. All candidates are advised to refer to the examination schedule for information on the examination time and instructions to be adhered to during the examination, the statement said. Candidates are also reminded to bring their respective identity cards to the examination centre to ensure the examination runs smoothly, said the statement. You are currently browsing the archives for the PMR / PT3 examination category.